- "This open access book deals with contestations 'from below' of legal policies and implementation practices in asylum and deportation. Consequently, it covers three types of mobilization: solidarity protests against the deportation of refused asylum seekers, refugee activism campaigning for residence rights and inclusion, and restrictive protests against the reception of asylum seekers. 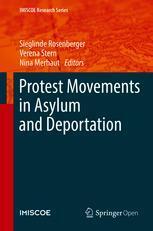 By applying both a longitudinal analysis of protest events and a series of in-depth case studies in three immigration countries, this edited volume provides comparative insights into these three types of movement in Austria, Germany, and Switzerland over a time span of twenty-five years." - Follow link for main report as well as 7 national reports for Cyprus, Estonia, Greece, Italy, Malta, Sweden, and the UK. See also related news release.